Located on the quiet, non-driving side of beautiful New Smyrna Beach, this renovated, NON-SMOKING and NO PETS, 3 bedroom, 3 bath, completely furnished, true direct- oceanfront (25 feet from the beach with 100% unobstructed views), 2nd floor, corner condo unit offers the peace and tranquility associated with being directly on the ocean. THIS UNIT IS VERY CHILD FRIENDLY (toys, games, books, DVD's, dolls, pack n' play crib, baby monitors, high chair and much more). Our property is also very close to a park with a children's playground where you can see manatees swimming by in the intercoastal waterway. Our family has owned this condo since 2003. We invite you to read more about our special beach condo by reading the online guest reviews. One warning however, after 11 years of owning this property we have had two guests that posted guest reviews that were mean spirited and unfortunately not factually accurate. The last guest posted theirs almost 1 year from when they stayed and included lies about our home. They never once contacted us during or after their stay to allow us to correct any problem they were having. If you decide to stay in our home and have ANY issues while you are there please call us or our property management company and we will take care of whatever issue you are having. Our goal is having all of our guest being 100% happy with our home and helping create a long lasting wonderful memory for families. A spacious kitchen with a full selection of large and small appliances, kitchen utensils, pots and pans, dishes and glassware. There are also 3 bar stools so you can enjoy informal meals on the extended kitchen counter. Plus the fantastic views of the beach from the many windows will make meal preparations a delight. The spacious living room has fantastic unobstructed views of the beach and ocean (which are only 25 feet from our balcony). There is a very comfortable new couch and loveseat and a wicker Pottery Barn chair and footstool and all new carpeting. You have easy access to the direct oceanfront balcony where there are chairs (and a table) for dining or reading. Plus we also offer a new wall-mounted 50' LCD smart TV in the living room, with a DVD Player offering Free Netflix access to over 20,000 movies. The best part however is one we had nothing to do with - the incredible views of the beach and ocean (you will often see manatees swimming nearby along with pelicans looking for a quick meal). Our master bedroom has a large king size bed (new comfortable mattress Feb 2018), private full bath, large closet, access to direct oceanfront balcony and 32' LCD flat screen TV with easy access to both Netflix and HuluPlus at the touch of a button. The views from the master bedroom are outstanding with direct unobstructed views of the beach and ocean. The second and third bedrooms each have two twin beds (all new mattresses Feb 2018) and full bathrooms. A pack n' play crib is also available for our guests. There is also a top-of-the-line Aerobed self-inflating air mattress (very comfortable) along with a floor mattress. Each room has flat screen TV's with one having a new 32' smart TV with free access to both Netflix and HuluPlus available. The linens and bed spreads are all newly purchased for our guests to enjoy. In the third bedroom there is a collection of sporting equipment (for our guests to enjoy), plus many children’s books and toys. In the second bedroom the closet has puzzles and games along with baby monitors, and bed side rails for each of the twin beds. Our condo is one only a handful on the beach that has 3 full bathrooms. The master bedroom bath has walk-in shower. The second bedroom bath has a shower/tub and can be accessed from the second bedroom as well as the hallway. The third bedroom has a private shower/tub. Crown molding and 5 1/4 inch baseboards throughout. Six panel doors with upgraded hardware. Up-to-date knock down texture on the ceiling and walls (you should see what it looked like before – and other similar units still have the old popcorn texture because it is so difficult to remove). Total living area is a spacious 1786 square feet. This special Condo with east and south exposures offers completely unobstructed views of the ocean from the living room, dining area, kitchen, master bedroom and covered beautifully private balcony. An abundance of windows and sliding glass doors brings in natural light that brightens all rooms. Note, all new top-of-the-line windows and sliding glass door will be installed in April 2018. The second floor location is the perfect elevation to enjoy views of the ocean, surf and beach while seated in the living room, making a feast in the kitchen, having dinner in the dining area, lounging in the master bedroom or just relaxing on the porch. Access is also convenient by elevator, or one quick flight of stairs. The beach is literally 25 feet from our condo. You can talk with people at the beach while on the balcony. There is a manicured lawn between the condo and the soft sands of the beach. Guests also have access to tennis rackets, kites, basketball, toys for the kids, puzzles and games for all ages, a collection of books, videos, DVD's, CD's and cassette tapes, beach toys, boogie boards, skim board, pool inflatables, beach umbrellas, beach chairs and beach buggy to easily transport all items to the beach. All of our renters have access to the property's 12th floor penthouse recreation lounge which provides an area for special gatherings and recreation complete with kitchen facilities, 2 billiards tables, card tables, collection of books and puzzles. The roof deck opens to panoramic views of the beach and the river and is an excellent place to enjoy spectacular sunrises and space shuttle launches. Our condo is professionally cleaned after the departure of each guest. We also do a full deep cleaning every 6 months. We have a Dyson vacuum cleaner which is the highest rated vacuum on the market. The condominium offers a new entry gate system shortly making this one of only a few facilities in New Smyrna Beach with restricted gated access. In addition, high speed wireless internet access is now available for all renters so you can stay connected to the world while listening to the soothing sounds of the ocean waves. Enjoy the many activities that come with being on 14 miles of the finest sandy beach. Be warned once you stay here you'll want to come back again and again and again. We recommend that you call today to reserve your space as our condo books up very quickly. And, if you have never been to New Smyrna Beach in the Fall and Winter find out for yourself why the locals feel it is the best kept secret in town - New Smyrna Beach in the Fall and Winter is one of the best times to visit. No crowds, outstanding weather, lower prices and close to a private beach all to yourself. Our family lives in nearby Winter Park, Florida and has owned this lovely condo for over 15 years. We also own two homes in beautiful Deer Valley Resort (Park City, Utah). You can view them on VRBO – listing 55322 and 68593. We love to share our vacation properties with other families. Our goal is to help create happy memories for our guests. During the 15 years we have owned vacation properties (3 in New Smyrna Beach and 3 in Deer Valley, Utah at one point) we have received so many wonderful comments from our guests. Every year this condo is reserved for over 30 weeks by guests from all over the country. Truthfully over the years there have been times where things were not perfect – a child may have had an accident in the pool so the pool needs to be shut down until the pool company can clean it appropriately. Sometimes there has been a leaky toilet in one of the units above our condo so that needs to be repaired before our ceiling is repaired. Sometimes the professional cleaning crew that is hired by our property management company has missed something. As with homeownership things will happen but what is most important is what happens when things are not perfect. We always try to make guests happy. If there is a problem it will be addressed. All we ask is for our guests to communicate with us and our property management company in New Smyrna Beach and the onsite property manager and the issue will be taken care of. We will do whatever it takes to have happy guests. We hope you too can enjoy our beautiful beach condo. CHECK OUT OR NEW VACATION PROPERTY WEBSITE - HeringVacationProperties Dot Com Happy Vacationing! Our family lives nearby in Winter Park, Florida and we love staying in our beach condo as much as possible. With our children in school and involved in many activities we usually have to enjoy the property vicariously through our guests who often send us emails and photos telling us how much they have enjoyed their stay at our special beach home. New Smyrna Beach is the beach where families from Central Florida (Orlando) have been going to for many years. There are many other choices for beaches in the area (Cocoa Beach, Titusville, Daytona Beach, Melbourne, Ponce Inlet, and others) but New Smyrna Beach is the number one choice amongst locals here in Orlando. Why? It is very family friendly, easy access to Orlando (1 hour drive), and has a beautiful 14 mile pristine beach. The easy drive to Orlando allows guests to enjoy Disney, Sea World, Universal Studios and other fun attractions that Orlando offers. The Southwind condo is one of the few properties that are gated which makes our beach area much more private. Our condo is the only one on the beach that has a manicured lawn between the property and the beach making it very much like a private home. Our property is located on the southern end of the beach which does not allow cars to drive on the beach (the north side does allow cars to drive on the beach). With our unit being on the second floor corner unit you have incredible views of the beach and ocean. Our unit has 3 bedrooms and 3 baths which is great for our family. Most 3 bedroom units on the beach only have 2 baths. There is a huge difference between our condo and most others. We bought this property with the goal to make it the most guest friendly one on the beach. We love having families with children enjoy our condo and have added many amenities for children that very few other properties have (baby monitors, side rails for beds, many many toys, games, books, DVD's, and more. Check out our guest comments and see what other families have said that have stayed in our condo and we hope to share our unit with you too. Showers in all bathrooms with tubs in 2 bathroom. Downtown New Smyrna Beach 5 minute drive from our property. The only thing that seperates the beach from our property is a beautiful 25 foot deep manicured lawn. Telephones available in kitchen and master bedroom. Central heating with control in unit. All linens provided which include bedding, bathroom towels and beach towels. Our home has a side by side washer and dryer inside the unit. We also offer our guests a clothes dryer to use which is located inside our home. Onsite parking in gated parking area. Free wireless internet access available in our home. We just updated the router to offer the best reception for our guests. 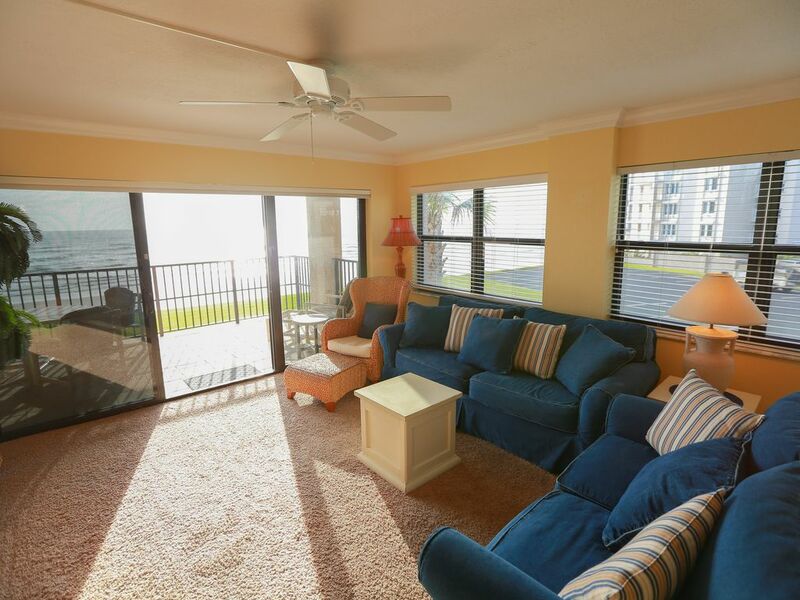 Direct oceanfront views with plenty of comfortable seating on our couch, love seat and Wicker chair. No need to wash dishes when you are at the beach. Let the dishwasher do the cleaning for you. Spices and basic cooking supplies and more. Plenty of dishes and utensils for the whole family to enjoy a special meal together. Full kitchen with beautiful direct oceanfront views. The kitchen is fully stocked with large and small appliances. New DVD Player with Netflix access to 20,000 FREE movies. We have board games, childrens games, and beach games. We have many CD's with a wide range of music for our guests to enjoy. We have many DVD's available for all guests to enjoy. Manicured lawn in between our condo and the beach. Great for playing catch or throwing a frisbee. Beautiful newly re-surfaced direct oceanfront balcony with outdoor seating and table with 4 chairs. Our balcony offers incredible direct oceanfront beach and ocean views. Plenty of pool and beach supplies including boogie boards and skim boards. Two newly resurfaced private tennis courts are for guests and owners enjoy. All located on one level. Large direct oceanfront pool for all guests to enjoy. Great for kids, a lot of toys, 3 full bathrooms, great beach views. The front of the building was under construction during our stay which made a couple early mornings noisy but nothing super inconvenient. The pool heater was broken so the pool was too cold to be used until our last day when it was fixed. It was great once heated! The owner was very responsive and helpful from start to finish. I realize the pool temperature and construction are totally out of his control and we did not feel it necessary to complain to him about these items during our trip. The beach is a short walk down one staircase and was never crowded even during prime Spring break time. Overall, nice and spacious condo for the price. This condo has a beautiful view of the ocean and very good access to the beach. The pool area is lovely with lots of chairs. The other amenities are very good. The condo has ample space to enjoy time with family and friends. Great location and everything a family needs for a week at the beach. We just spent another wonderful week in this beautiful condo! This condo is located in a quiet spot on the no-drive part of New Smyrna Beach. Being a corner unit makes it especially light and bright, and the sights and sounds of the ocean totally fill the space! (We just discovered a whole closet full of ocean "toys"...chairs, boogie boards, umbrellas, etc., just in case you want to get even closer to the water!) We love this condo because it is well furnished, and has been lovingly cared for by it's owner. Just walk in, and it's like being at home. The kitchen is spacious and well equipped. There is also a beautiful pool, and outdoor sunning area, and on our last visit, we watched a rocket launch from the amazing roof top deck! Can't say enough good things about this condo! We will be back, hopefully for many years to come! I rented this condo with my siblings for a sibling reunion. The weather was cold and blustery so we ended up staying indoors a lot. We were still able to enjoy the beach by enjoying the views from indoors and cooking great meals in the kitchen. Because the beach was right out our door, we were able to take jaunts on the beach as weather permitted. Shopping was close. We will rent here again! This is a lovely condo, with everything we need for our annual gathering of five friends. Feels like home and the view can’t be beat! We will be back again next year! We certainly enjoyed sharing our direct oceanfront beach condo with you and look forward to your return visit. WE CATER TO WEEKLY GUESTS AND DO NOT OFFER NIGHTLY OR MONTHLY RATES. All bookings go through our long established property management company located directly in New Smyrna Beach. Fifteen percent premium added for Holiday week of 4th of July.